Janapati Lakshmi, a resident of Piduguralla village of Guntur district of Andhra Pradesh was married at an early age of 12, but due to some high fever, her left hand became paralyzed, weak and twisted. Due to this handicap, her husband did not take her at all. God, however, had bestowed her with a melodious voice and she used to sing Annamayya Kirtans and Bhajans to eke out her livelihood, supporting her mother as well. Even to tie her own sari was a difficult task for her. Because of this handicap she was nick named as "Kunti Lakshmi" or "Lame Lakshmi" in the nearby villages. As per some well-meaning people, they advised her to get the defect set right in Vellore and she set about collecting funds for her journey and surgery. When this was accomplished, she set about for the journey, escorted by her music teacher. When they reached Vijayawada, by bus, all of a sudden, after seeing the bus for Puttaparthi, she changed her plans and requested her guide and teacher to travel to Puttaparthi first and then proceed to Vellore after having Swami's Darshan. Accordingly when they reached Puttaparthi, at the bus stand it­self, they learnt that Swarni was at Brindavan. As per advice of some local residents, they went to Brindavan to have Swami's Darshan. By a stroke of luck (or is it Swami's Grace!) she was seated in the second row, behind a lady who was awaiting Swami's blessings on her birthday. When Swami came near the lady, Lakshmi touched the Lotus Feet with her right hand and then wanted her left hand also to touch the Lotus Feet. With great trepidation she extended her left hand and touched His Feet and lo and behold! Her left hand became perfectly all right and straight. Joyously she cried out in Telugu "Naa Cheyi Baaga ayyindi" meaning, my hand has become alright. 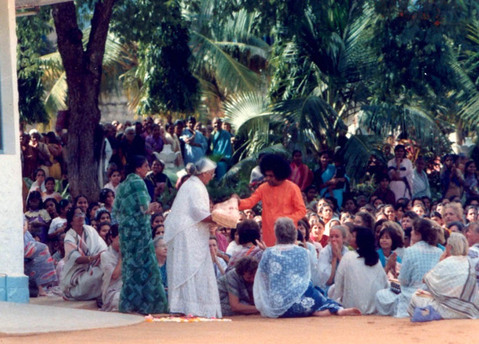 Swami smiled and graciously went off but other ladies nearby asked her to keep quiet, as she was shedding tears of joy and repeating the sentence - my hand has become alright. This was on 12th April 1990- after paralysis of seventeen years. Thereafter, abandoning her plan to visit Vellore, she returned to Puttaparthi. narrated her experience to a few here and returned to her village. All people of the Piduguralla village who came to know of the miracle were exhilarated and happy to note that "Kunti Lakshmi" or "Lame Lakshmi" had her hand perfectly restored. In one voice, they proclaimed that only God could do such miracles and Sai Baba was God. This episode is a thing of joy to theists and a puzzle to atheists and rationalists but to the people of that village Sai Baba is God.